More gluten free goodies! Aldi released their G-Free line about a year ago, and it's steadily been expanding to include all kinds of products. 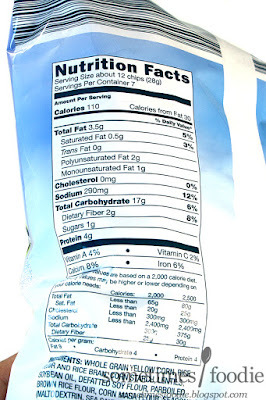 I think it's great, but "Gluten Free" foods like these tend to anger quite a few people. I partially understand why, to some this seems like a "hipster diet" or "trend," but there are people out there who truly need these products. I've mentioned this in other reviews, but I have a cousin with Celiac disease, so she and her two daughters (who also have it) can't process gluten. Having a food-related allergy or aliment and eating in a group setting can make a person feel singled out or isolated, especially when they're children at a snack or lunch table. For that reason, I like checking out gluten free products so that I can find yummy foods to share with friends and family regardless of a food allergy, and hopefully break the misconception that these specialty foods are bland, boring, or expensive. Okay, time to get off my soapbox and get to the food review. (Sorry for getting a bit preachy for a second there.) Time to stuff my face with chips! This is a no frills, store branded, product, but it doesn't look like it! We have the G-Free logo, a blue gradient sky-themed background, images of lentils and edamame to relate to the product itself, and some nicely laid out text. This bag is way fancier than other store branded products, so good for you, Aldi!. I don't really get why Aldi went with a blue sky theme for this line in particular, but overall, this is a really nice design. 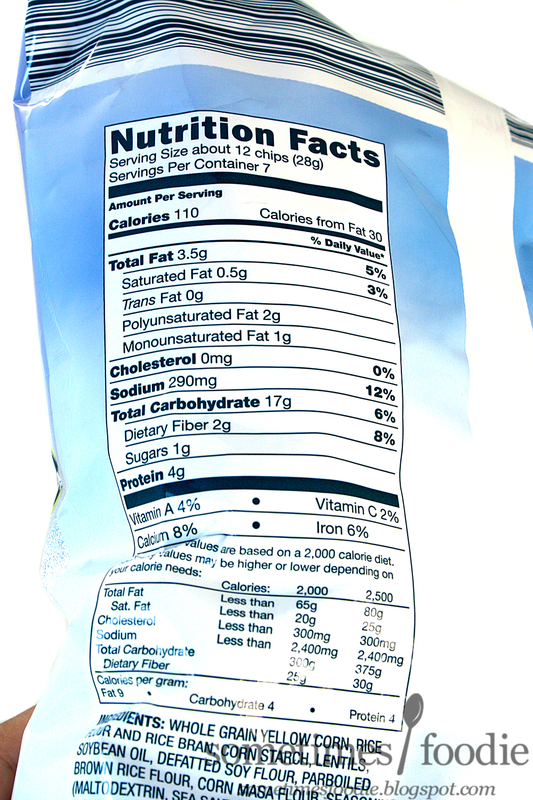 (Also, feel free to ignore the expiration date on the bag. What can I say? I'mafoodhoarder. I live dangerously.) Once opened, the "chips" inside don't have much of a smell. I mean, they smell kind of fried and oily, like most savory snack foods, but I don't smell any spices or garlic. Aroma-wise, these are pretty bland. Thankfully they taste way more flavorful than they smell. 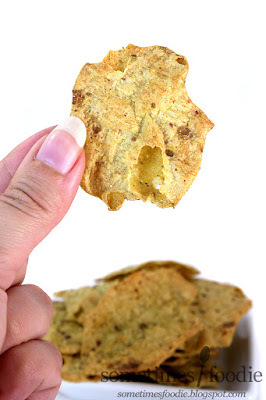 At a glance they look like a fancy tortilla chip, but they're a lot thinner, and they have dark spots on them made by little chunks of edamame. The chip itself seems to be all texture and little to no flavoring, but the powdery coating provides quite a punch of garlic. The garlic-y flavoring builds as you snack, and it eventually starts to taste a little reminiscent of Japanese style curry paste. Even though these are really crunchy and delicious, you might not want to snack on these if you're on a date. This garlic flavoring is intense. We're talking super garlic-y breath here. If you're alone, and you love garlic, these are awesome, but they might not be the best choice if you're having a party. 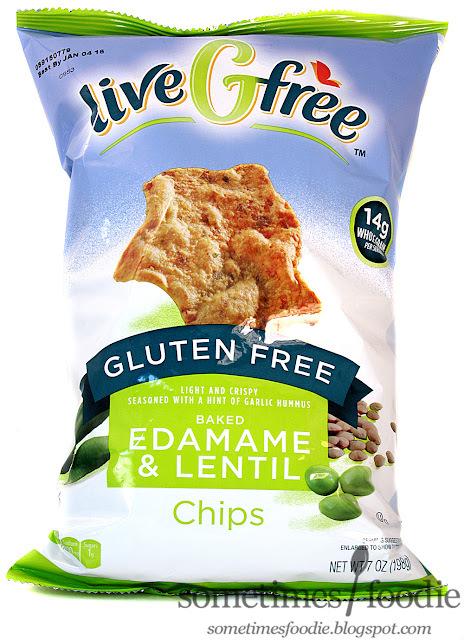 Gluten free and specialty products carry a stigma of being bland and boring, and these chips are anything but. If you're into garlic, these are an amazing snack regardless of their gluten-free-ness, but you might want to keep some mouthwash or gum handy if you plan on talking to anyone after your little snack attack.